Just a quick note to say we’re back from Texas. The above photo is of a Century Plant we saw in beautiful Big Bend National Park. 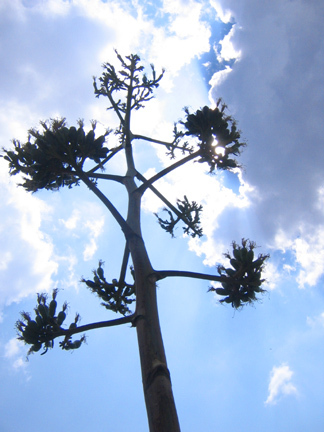 The plant (which looks kind of like aloe) grows for about twenty five years, blooms (as above), then dies. I saw such an array of plantlife in the desert, it was amazing! I felt like I was in an aquarium that had been drained of water. More on the trip to come in my flickr once I sort the photos- including a visit to Santa Fe and a steep mountain drive in Wyoming (3600 foot drop in just 10 miles!). it was lots of fun, but i think we killed the car with it. oops. it really is nice to see so much nature. even trees make me want to cry. i can ride my bike around and there are mountains at the end of every street! Oh, Big Bend! I love that park. It was my last trip there that convinced me I had to get out of New York and move where I could be closer to natural beauty, like mountains and desert. I'm jealous of your trip! I should have asked if Noah the travelling gnome doll (a project of mine on Flickr) could have gone with you crosse country and up and down :) country. We could have dreamed a little. good energy to you while unpacking. Lindo has made it home!